A delicious, Christmas-y bake! Of course these would be appropriate at any time of year, but adorned with red and green jewels, it is hard not to associate these with Christmas! These would make an ideal last minute gift or treat for unexpected visitors! So Christmas is very almost here, and I’m breaking with tradition of a Sunday post to give you an early present! 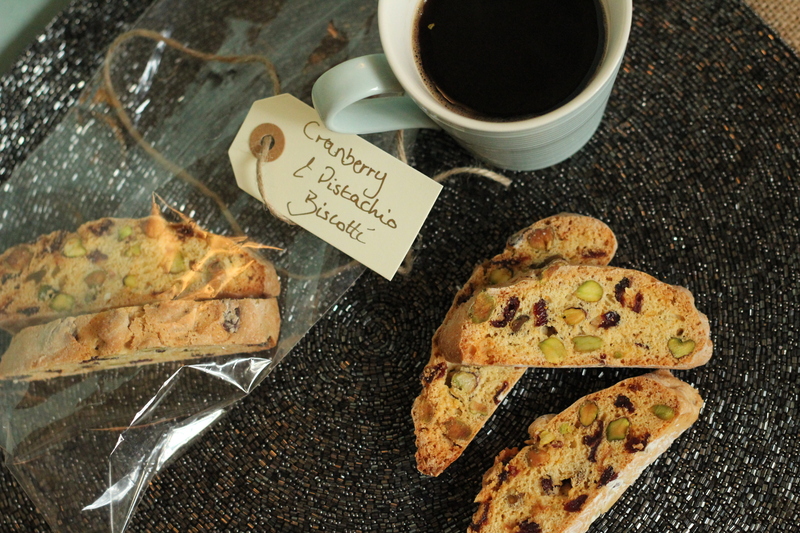 These Cranberry and Pistachio biscotti are the perfect thing if you are still in need of a present for someone. I promise they’re fool proof, and the great thing is if you don’t have cranberries or pistachios, then you can easily substitute them for another fruit and nut combination. December always flies by, and this year has been no exception. I’m therefore really quite pleased with myself for having made the plethora of home baked gifts this year. 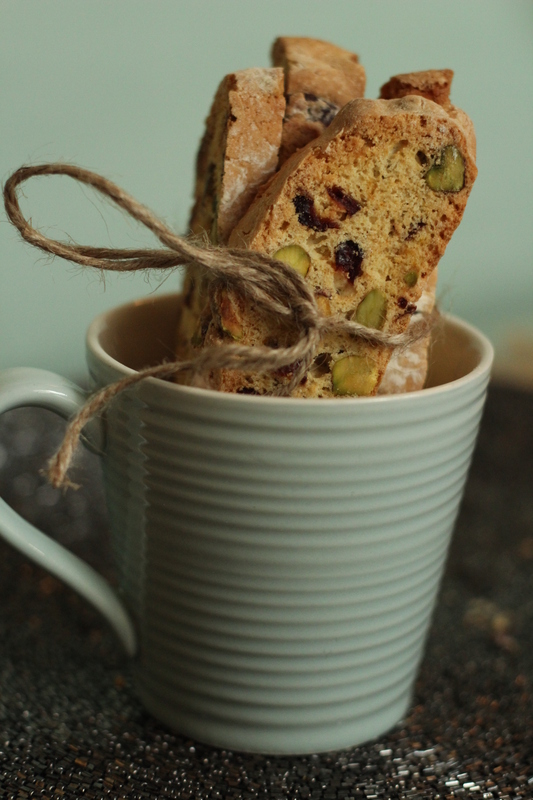 That was what inspired this post – I wanted to make a Christmas worthy biscotti. 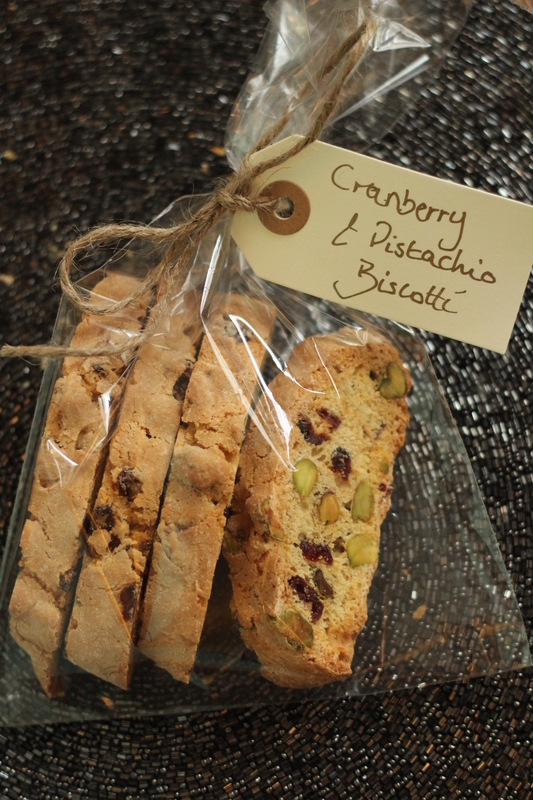 Biscotti in Italian literally means twice baked, and in Italy, there is no association with Christmas at all. 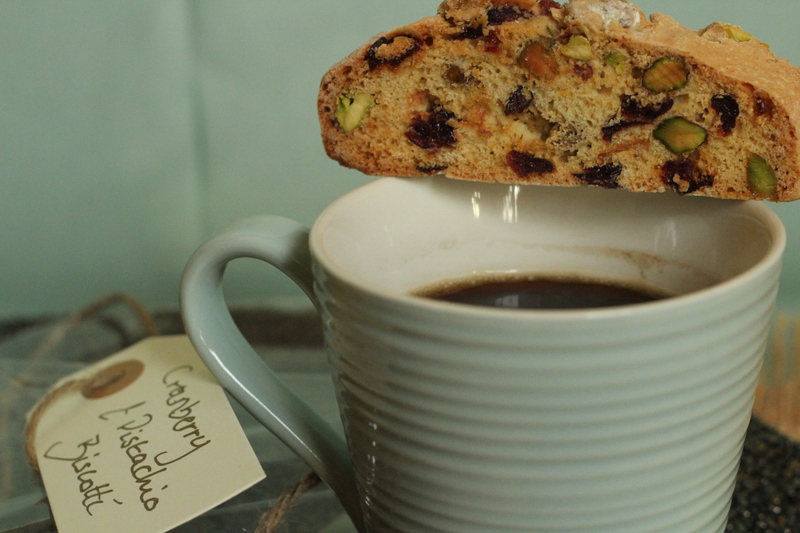 However, here in the UK, biscotti have become a sort of ‘only at Christmas time treat’, and to be honest, I can see why! Versatile in the sense you can use lots of different flavourings (read – whatever you have lying around the house!) and they last really well. They can easily go a week in an air tight tin with no issues at all, which is also partly what makes them such a great gift to give. I decided to use cranberries and pistachios for flavours here – there I was thinking “how original” until I googled it and found everyone has already done it! But, original idea or not, this is a great flavour combination. 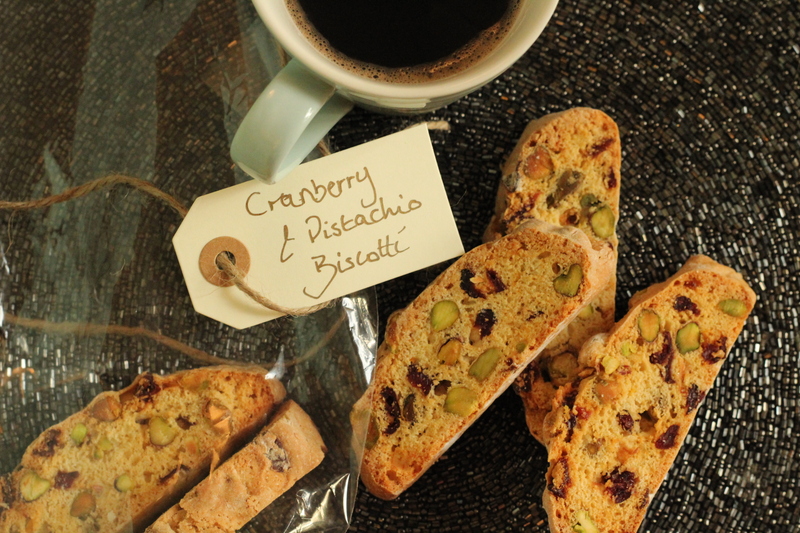 The slightly sweet and soft pistachios contrast with the sharp cranberries; the small amount of orange zest just lifts the whole biscuit and makes it perfect to go alongside a black tea or coffee (or do like the Italians and dip them in wine!!). So, if you find yourself in need of a simple bake with household ingredients, or worse still, need a quick present you can rustle up for an unexpected visitor, look no further! I can promise these will be ever so gratefully received. Makes 12 biscotti. Takes 25 minutes, plus baking and cooling time. Preheat the oven to 180 degrees and line a large baking tray with grease proof paper. Whisk the egg and sugar until light and mousse-y – the mix should leave a trail for 1 second when you lift the whisk out. Beat in the orange zest, then fold in the baking powder and flour. Fold in the pistachios and cranberries, then tip out the dough onto a lightly floured work surface and shape into a ciabatta shape log, about 25cm long. Place onto the baking tray, and bake for 25 – 30 minutes. You may need to turn it around in the oven after half the time to ensure an even bake. Once baked, remove from the oven and leave to cool on the tray for 5 – 10 minutes. Using a serrated knife, slice into 1cm thick fingers at an angle. Place the biscotti back on the baking tray, and bake again for another 12 minutes, turning them over after 6 minutes. They should be lightly golden on both sides, and hard.